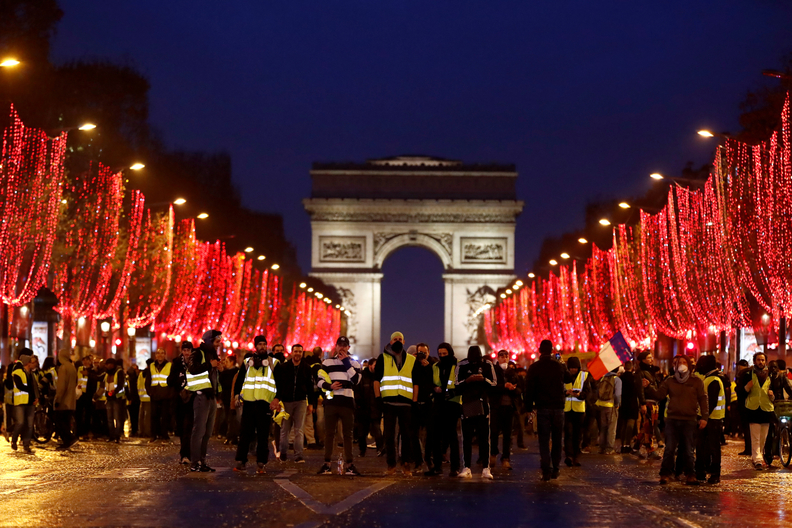 Protesters take part in a demonstration on the Champs Elysees near the Arc de Triomphe in Paris. The "yellow vest" protesters, named after the fluorescent jackets French motorists must have in their cars, have disrupted retail sales. PARIS -- French registrations fell 15 percent in December, hit by "yellow vest" protests against President Emmanuel Macron's tough economic policies. Sales of luxury cars were especially hard hit during the month as anti-government unrest spread across the country. The protests led to a 16 percent decline in retail sales on Saturdays when the demonstrations were held. Auto dealerships were affected because a lot of the country's suburban dealer clusters are near traffic circles and shopping malls where the protesters have been stopping traffic, leading to potential car buyers staying at home. Registrations of Porsche vehicles plunged 73 percent in December. Alfa Romeo sales fell 51 percent, Audi sales were down 39 percent, BMW registrations declined by 31 percent and Mercedes-Benz brand was down 22 percent. Other brands that had a bad month were Nissan, whose sales fell 57 percent, and Jeep, down 45 percent. Total new-car sales fell 15 percent to 165,390 vehicles. There were 20 selling days, the same as in December 2017, the CCFA auto industry association said. Market leader PSA Group had mixed fortunes in December, with Citroen's volume gaining 14 percent as the new C5 Aircross SUV reached the market while Peugeot brand sales were down 7.4 percent, Opel sales dropped by 10 percent and DS registrations fell by 11 percent. Overall group sales fell 1.9 percent. No. 2 Renault Group's sales fell 19 percent with Renault brand registrations down 22 percent and Dacia sales down 13 percent. Volkswagen Group sales were down 14 percent. VW brand sales declined by 10 percent, while Seat's volume rose 19 percent and Skoda sales were up 16 percent. Ford's registrations fell by 14 percent. Click here to download December and 2018 French sales by automaker and brand. Total market sales rose by 3 percent to 2.17 million in 2018, although there were 252 selling days, compared with one less at 251 in 2017. Sales were up 2.5 percent on an adjusted basis. The increase comes after three strong years of growth in France, Europe’s third-largest automotive market after Germany and the UK, but monthly sales swung wildly throughout the year, largely as a result of issues with new European type-certification procedures. Sales leapt by 40 percent in August ahead of a Sept. 1 deadline to certify cars under the Worldwide harmonized Light vehicle Test Procedure, or WLTP. Automakers offered generous incentives to sell uncertified cars before the deadline, boosting sales in the summer, normally a slow selling season. Many cars and variants were not able to be certified on time and were thus pulled from the market in the autumn. The August sales boom led to an autumn hangover as demand for new vehicles dried up. Registrations fell 13 percent in September, 1.5 percent in October and 5 percent in November. Automakers and analysts expect that disruptions from WLTP will continue through the first quarter of this year. Annual sales of diesel models fell to 39 percent of the market from 47 percent in 2018 and from about 70 percent in 2011. Gasoline models were 55 percent of the market. Sales of all hybrid models increased slightly, to 4.9 percent of the market from 3.9 percent, and electric vehicle sales inched upward to 1.4 percent from 1.2 percent. Sales of light commercial vans, which were unaffected by WLTP testing, increased 4.7 percent for the year and 2.9 percent in December. French brands dominated the list of best-selling models, led by the Renault Clio, the Peugeot 208 and Peugeot 3008, Citroen C3 and Dacia Sandero. By body type, SUVs and crossovers made up 36 percent of the market, a 4 percentage point gain over 2017, with hatchbacks and sedans accounting for 50 percent, a one percentage point gain. Lower-priced models made up 55 percent of the market in 2018, compared with 51 percent in 2017.